Aircraft Deicing electric powered anti-icing carts from SkyGeek are used for anti-icing operations that involve SAE type IV anti-icing fluid. The carts are equipped with 12-volt, three-chamber diaphragms and non-circulating pumps that deliver excellent fluid flow for an uninterrupted spray. 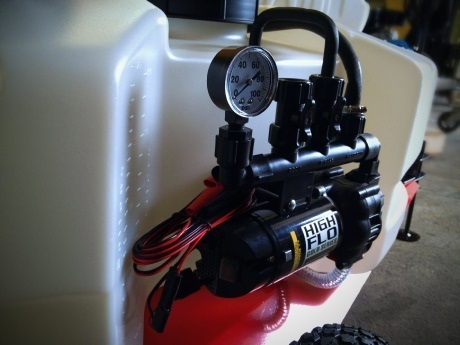 The carts deliver fluid flow rates of up to 2.1 GPM / 60 PSI. Because the carts produce no emissions and a lower fluid pressure than gas powered carts, they are suitable for use indoors or out. All electric powered anti-icing carts by Aircraft Deicing are built on a steel frame. They have a hinged tow bar with a pintel ring, durable wheels, an electric pump and a heavy-duty tank. An included pressure gauge, high-pressure hose and handgun complete the design and provide everything needed for safe and easy application of anti-icing fluid. There's even an onboard charging and battery system making these carts an all-in-one system that's truly essential for any hangar. Carts are available in 25-, 40- or 60-gallon tank sizes. They are competitively priced and ship quickly. A manufacturer's certification may be added to any order if needed.